Can I just say that dry, itchy eyes are the worst? At home, my eyes are fine and dandy–crystal clear and just the right amount of moisture. But when I go out, my eyes develop another personality. One that gets red and dry and irritated. Although I’ve always been armed with eye drops when I go out, I couldn’t help but think there must be a better (more natural!) way to address this problem. And by accident, I discovered an answer. Lavender mascara is my secret! 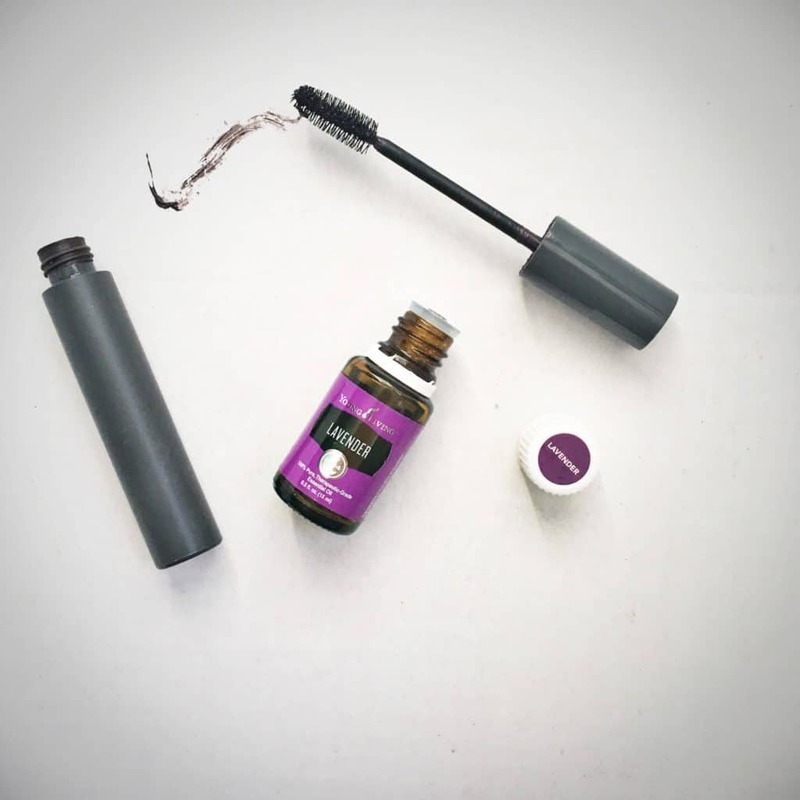 When I first got into essential oils a few years ago, I ran across the idea of adding lavender oil to your mascara. It sounded like great idea and I had my Young Living lavender essential oil handy, so I added a drop to my mascara. 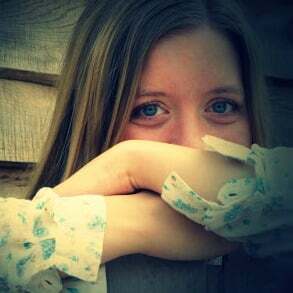 Right away I noticed my mascara stopped clumping (and smelled wonderful!). But after using it a few times I noticed I wasn’t reaching for my eye drops as much when I went out. In fact, I was barely using them at all! Adding lavender to your mascara (if you wear any) is one nifty way to keep a little lavender near your tear ducts, but it’s not the only way. You can also take a drop of lavender and rub it along the bridge of your nose. This simple trick works very quickly to relieve dry eyes. You can reapply as often as necessary (so keep a bottle handy if you get dry, red eyes when you go out). I find this works really well on days I don’t wear mascara or when my eyes are acting up more than usual. It’s especially handy during the spring season! NOTE: Do NOT ever put lavender oil IN your eyes! It will seriously burn. If you happen to get any essential oils in your eye, “wash” it out with a carrier oil like coconut oil. This will dilute the oil and help cleanse it away. PS: I order my lavender oil from Young Living because I trust their oils to be the highest possible quality. You’ll get a bottle of lavender oil in the premium starter kit when you sign up for Young Living. Get started HERE. 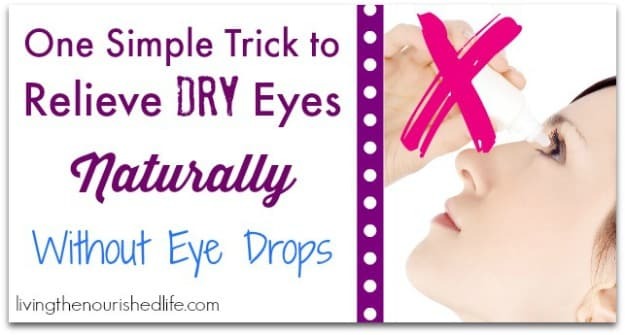 Love this tip for dry, red eyes? Pin it below! Hello Liz Hope you’re doing well… That’s very interesting, i used to use the optix spray where you spray on your eyes closed but they are quite expensive for a little bottle..And i really dislike dry eyes.. I have ocular rosacea which means my eyes are very, obnoxiously sensitive. Like you, when I am at home, things are usually alright, but if I spend any amount of time say, at the mall or grocery store or in the car, where the air is highly conditioned and forced by machines, I often leave feeling like I don’t want to even open my eyes! 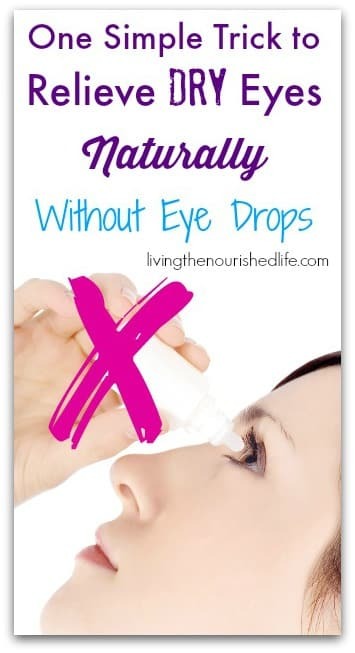 Eye drops have always been my go to, but this idea is indeed intriguing enough to try, though I don’t wear mascara so, you know, bridge of the nose it is! And if it works, less expensive too–bonus!! Clothing stores are the worst for me! I think it’s the air combined with the chemicals in the fabrics. Such an interesting idea! I went home last night and added a drop of Lavender oil to my mascara and I am wearing it today! So far so good but I can’t wait to see how it works out long term. I often suffer from dry eyes especially at work. Well I tried putting on bridge of my nose. I really didn’t think it would work but to my surprise it did. Thanks so much for the tip. Awesome! It’s crazy how simple it is, and it really works. I’ve been dealing with severe dry eyes and getting a little scared since it was getting worse. Then I happened on an article (maybe even on this site?) about putting lavendar oil on the bridge of the nose before bed….hallelujah it works! Now I will add some to my mascara! Thanks! Do you need to use a carrier oil with the Lavender on the bridge of your nose? I don’t. I find I like using lavender neat for most application. This is wonderful! I never knew lavender could be so beneficial for your eyes! I shared this with a friend who suffers from dry eyes, but for her, it’s worse in the morning. Maybe she can apply some lavender oil on the bridge of her nose before bed, like you suggested. This was excellent! Awesome, Robin! Let me know how it works. As soon as I read this I went and put some of my YL lavender on the bridge of my nose & I can’t believe how fast my eyes reacted. I was unsure because I wear contacts but I am happily impressed. Thanks for the tip!! So glad it worked for you! It really is amazing how quickly it works. Hey! I’ve also tried this ‘trick’ and I find it really good. I wear contact lenses and I had absolutely no problem with my eyes, plus the mascara smells amazing! I was actually wondering if it would help for those with contacts! I just started really having problems with dry eyes over the past two years or so and nothing helps, not even drops. I am definitely trying this! Thank you! Hi, so I added some to my mascara and the cap of the mascara cracked??? Hmm, I don’t think the lavender oil would have caused that. You would not believe how well this works. How long do the results last? I notice it works for an hour or two on most days. If my eyes are extra dry, I might need to reapply to the bridge of my nose every hour. What I discovered a while back, is that being low on Vit A can cause dry eyes…. I tried and it helped a lot…so it fixes from within instead of on the outside. I started using lavender oil on the bridge of my nose. It really helped except the skin on my nose reacts it gets itchy and red. Any suggestions how I can prevent that. If you have sensitive skin, neat lavender may be too strong. Try diluting it 1:1 with carrier oil and see if that helps. Also, not all essential oils are the same quality. Some have added synthetic and fragrances, and there isn’t good regulation about what “pure” means on an essential oil bottle. Make sure you’re buying from a company that truly cares about quality.